After you have created your Purchase Orders for the products you want to order and you have configured your POs, it is time to send the purchase orders. You can send multiple at once, or just one at a time. To send all purchase orders, look in the upper right and you will see a split button. This will send the purchase order for you. To send individual purchase orders, you can click the menu in the PO and click send PO to the supplier. This will send just this PO to the appropriate supplier. 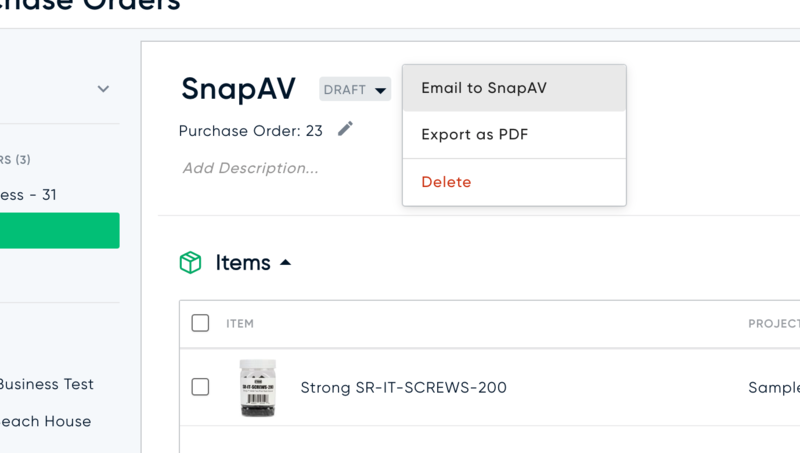 After you click the Send POs button, it will prompt you with a confirmation asking you to confirm the purchase orders, total, and quantity of items. It will also make sure you are sending it to the appropriate person. You can edit the email for who to send to by clicking on the edit pencil icon. You can also export the purchase orders as PDFs if you want. You can always add yourself to the email too. After sending the order, the status will be updated to Ordered. Don't forget to mark as received after you receive the order. The Purchase Order will be emailed to the supplier. The supplier can reply directly to the email which will email you back if they have any comments or questions.